Today’s post was planned as ‘Zipping to a close with Zeal’ and the results of some painting. Zod’s Law (being a more polite phrase than with an S), since my last post for ~Y~ my energy was zapped to zero and pain levels zoomed. I spent most of Sunday having many extra zzzs and was too unwell for painting or drawing today too. So the twist for today with my still life is that I am presenting precisely ZILCH in the way of new art. So hey, I brought new art to my post after all – and the ZEKE filter in MSPhotos gives it an extra little raZZamataZZ. I suppose if I’d had the sense I was born with, I’d have decided along the way to simply print a photographic still life and put that in a frame and never mind the extra effort needed to make a painting. But that would somehow be missing the point. Anyway, I haven’t entirely abandoned the idea of painting, and we’ll have to wait and see what arrives with my Reflections post on Monday 7th May. Apologies for any disappointment (although you must have seen it coming, if you’ve been reading along the way of my A to Z posts). 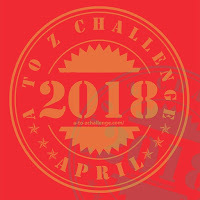 If you’ve been taking part I hope you’ve enjoyed the A to Z Challenge. If you’ve been reading, thank you for your time and thanks to everyone who’s hit the like or left comments, your support has been much appreciated. ‘Y and Y not’ was my planned title until I reached here to write and decided my alternative title to accompany another painting of mine from the past. In April 2010 I spent some time back at my childhood home with my Mum. As the weather was fine and warm we visited a local seaside town for a day out together with my youngest. We talked a lot about my Dad, remembering days at the beach we or they had enjoyed before he died, fifteen years previously. During the afternoon I collected a few found objects from the beach, including some seashells that I later made a painting of during May 2010, and that made in a way as remembrance of my father. I can hardly believe 8 years have passed so soon since that day at the beach and the 23 years since my father died seems to have flown in the blink of an eye. Copyright: Colette Bates. 2010, (2015 via ‘from Corner2Corner’, I assert origination of this painting, Colette B., The Wishing Well, copyright 2018. Fair Use for personal and educational use only (as per UK Law). I was tempted to start drawing and/or painting something around a Y shaped branch: I have one saved outside getting very soggy with rain, but found one to hand indoors. Then I remembered it doesn’t really fit well with my overall topical theme for this month. But it maybe solved another challenge entry, I’ll be posting that next. I’ll just give a very quick mention to some artists I had a quick look at for today’s art history perusal. Assuming the name Jan to be pronounced as ‘Yan’ in these cases, Jan Jansz Treck (1606-1652), Jan Philip van Thielen (1618-1667) and Jan Jansz den Uyl the Elder (1595/96-1639) were all highly accomplished Flemish/Dutch still life painters, usually of flowers. Yes, I’m muddling along this weekend, and hopefully will be in good time with a final something new for ~Z~ on Monday. Yay! How’s YOUR final weekend of April going? Are YOU nearing the A to Z finish line? Leave me your link in a comment if I haven’t made it yonder to your posts yet and I’ll be there as soon as possible. As might be expected, finding art history examples for the letter ‘X’ seemed unlikely. However, I found an excellent still life work as XYLOGRAPHIC print by Pēteris Upītis, titled “Thistle”, (1942). This was exhibited last summer 2017 at the National Library of Latvia and can be seen at this link: https://lnb.lv/en/xylography-exhibition-engraving-wood. XYLOGRAPHY is a specific type of wood-cut engraving for the purpose of block printing. It appears to have been brought to Europe around the 13th century from China, where it had been in use many centuries earlier for printing fabrics (ie. silk) and later for printing onto paper. The quick drawing below, although naiive, and inaccurate, was a really useful excercise in observing the shape and surfaces of the crystal clock I selected as potential still-life object a few posts ago. It didn’t leave a ghost image, perhaps because it was drawn on a chalky layer that remained after wet-wiping the previous images. X marks the spot apparently, if only I had the map…! I had planned to show a couple of small watercolours (2009) and maybe even washing-up (from way back when). They all have to wait … Maybe rather than updating this post I’ll just post an AZ extra on Sunday’s rest day to make up for wrestling with woes and whatnots and stop wringing my conscience. Jan WEENIX (1642?-1719), is the only still-life painter I came across so far for today’s letter W. I’m sure there must be more. I was interested in one of his paintings appearing to have a painting as a background, but his still life are all dominated by dead animals and birds, so I didn’t want to bring those images here to my blog. So, I looked wider, to still life photography, and discovered Edward WESTON (1886-1958). There are two beautiful still life type photographs made by him at http://edward-weston.com/edward-weston/ one titled ‘Lily and Glass’, 1939 and the other ‘Cabbage Leaf’, 1931. Well, there went another day with the A to Z and a long weekend to look forward to while the challenge draws to a close, with workspace resolved for painting (yes I found my paints!) and mind whirring with ideas of all sorts of ways of whiling May away with art. The section below shows my Bible, I’d bought that myself when I was eleven, either with gifted money from my Nan or with the book voucher I’d won as a prize for attainment in English lessons at school. I’m still trying to remember that detail, maybe I combined both £5 amounts – that was a lot of money in those days and I’m fairly sure my Bible was quite expensive. I wonder now what were the two other books in my painting and why were they there? And do I still have my C-leaf pendant? The VODKA bottle made it into the picture as an empty bottle that I retained after it was gifted me by a special friend at my 21st birthday celebration. I’m not sure I still have it. My guitar was also a gift for my 21st birthday from my parents, they’d visited me here in Nottingham and took me to the city to choose it. At the very back of the painting is a brass teapot ornament that I dug out of my very first garden after moving from my flat to my first house – probably my very first ‘found object’. At the very front left is one my son’s first walking shoes, they squeaked when pressure was applied to the soles to encourage walking – he’d been pulling himself up and standing for ages but couldn’t walk until eighteen months old, I dunno if the shoes helped, but at least he learnt to walk! The whole arrangement is on a blanket I still have from childhood, more faded and worn now than then, as am I.
Suzanne VALADON (1865 or 1867- 1938, I’m not sure why there’s a discrepancy with her date of birth, intriguing). Valadon was painting in Paris around the time of French Impressionism and was associated with Degas and others. There’s something vaguely ‘Van Gogh’ about her style in the still life paintings I’ve seen so far. Anne VALLAYER-COSTER (1591-1632) was a very skillful painter, one of only four women to have entered the Royal Academie de Peinture et Sculpture before 1800 (or thereabouts). She’d entered two still-life paintings for exhibit in 1771 and was subsequently unanimously elected by the academics who saw her work. Perhaps her work would be an example of VIRTUOSO still-life, but some of her pieces definitely appear to qualify as VANITAS works. VANITAS still-life paintings are “a collection of objects to remind the spectator of the transience and uncertainty of mortal life” and “speak an immediate universal language” (Penguin Dictionary of Art and Artists). They often have a moral or religious context with symbolic or emblematic visualisation and are sometimes also devotional. The name apparently derives from Eccliastes (i:2), ‘Vanitas Vanitatum…’ and now I have a vested interest to pick up my Bible and read that chapter and verse, so perhaps will. I was also reading a little on the traditions of Varnishing Day, when painters retouched their paintings before exhibition opening, often competitively when they saw each others work to be displayed. Turner is said to have habitually only half-finished his paintings, completing them only on Varnishing Day. The now customary VERNISSAGE apparently grew from that earlier tradition, that being the Private View, the preview for invited guests. Back to VALUE – in technical terms, this usually refers to tonal value, as gradation of monochromatic tone to suggest darkness and light. Colour values in the pictorial space often require creative license to be applied to add contrast to or emphasise areas with similar tonal values. Tip: When observing objects for still life drawing or painting, looking through squinted half-closed eyes helps to reduce the areas of colour to reveal visible tonal contrasts. Briefly, before closing and veering slightly off-topic perhaps, VERISMO was an Italian form of Realism preceding Impressionism – I haven’t yet found any still life examples but wonder there must be some (it also has a musical meaning in operatic terms). VORTICISM was a British art movement around 1914 that fascinates me for the abstract compositions, similar to Futurism and Cubism, some few examples of which might appear to relate to objects. I’ve added digital text to my photo of a 2012 drawing of mine, originally made as a design element for the cover page of my ‘career plan’ made during work-related activity training, hereby updated, especially for ‘U’. … I’m undecided if this drawing is unfinished or not, as at the time it was deliberately left as is. I’ve been wrestling with my conscience over making art for art’s sake and drawings for the sake of drawing. However I’ve arrived at the conclusion that while I continue to practise drawing, ie. next month and beyond, I could do so with the intention of collecting my loose-leaf stuff together and assembling it as a memory book or personal journal. I don’t usually do artistic ‘journalling’ although I admire those whose work I see online – and mine probably won’t turn out anything alike. Those pics (above) were ‘old’ … what’s new for ‘U’? Ok, you can barely see the photo (shown right)… one of my drawings from timed excercises. I got that far in seven minutes – and should have got further. I could have worked more on this drawing but decided to leave it as is, because I see it’s potential as something to complete another time for that memory book. Similarly, I’ve left most of my timed excercises for their potential repurposing, wondering I can colour them, tear them up, make them somehow else – anything other than this one significant picture I’m reaching for. I definitely need more practise to get my drawing speeds up. Although there’s really no need to rush. As an art student we had to fill large sheets of paper with whole images sketched in as little as two, three or five minutes. That was a very long time ago though, and I have to keep reminding myself that the unwanted devil of a fine art tutor on my left shoulder voicing jibes and prodding me to remember formal conventions is an academic trapping and unnecessary to listen to in the context of my project here. I’m not trying to make a portfolio or accomplish a set of standard criteria. I’ve found myself hankering after making abstract versions too during these excercises. The following non-dominant hand drawing was one of my favourites for potential abstract play (at a later date of course, needing to keep some UNITY to my theme). I’m reaching the point of ultimatums as we near the challenge completion date. Do I need a frame for a watercolour or am I using acrylic and painting a canvas? I still need to UNEARTH paints – or should I dash out and buy more?! I really need to make a start with UNDERPAINTING if I opt for an acrylic painting on canvas. Am I wasting time by drawing when I really want to be painting? (No, I don’t think so, observational excercises are helpful to the process, I just mustn’t use up all my time and energy with them). Am I really waiting in the hope of getting flowers and anything else I convince myself I really NEED? Have I even decided my final selection of objects? Just as I have a fine art tutor uttering in one ear, in the other I hear my mother whenever I think of shopping for flowers and art materials for this project. She’s there reminding me of the uneconomic-ness of buying flowers for the sake of sentiment and art – and the uselessness of art full stop. She worried about us ‘wasting money’ on flowers to take to her grave, but she knew we would want to. As I live over a hundred miles away I’m easily excused the luxury of keeping flowers at home when I buy any in remembrance of my Mum and she preferred it that way too. She was a very unselfish lady. Finally, a tip I was given (as an adult learner from a practising fine artist/tutor rather than ever learning something so USEFUL from a full-time academic fine art tutor) and really must remember whilst drawing: always turn your drawing round and look at it while it’s UPSIDE-DOWN to check accuracy of things like proportions and perspective. Any drawing or painting tips you’d like to share? What’s your favourite memory around art-making? If you’re doing the A to Z challenge, or any other project over time, do you have a devil and an angel on each shoulder and what are they telling you? Today I thought I’d focus my efforts toward TECHNIQUE, including TEXTURE and TONE. I will be practising some very short TIMED excercises throughout the remainder of the day and tomorrow. So, getting my post out of the way early is a bit of a TEASER as you won’t get to see any of these results until Tuesday or maybe through to Thursday or Friday. TROMPE L’OUEIL is a type of still life painting I’ve been interested in while THINKING around my project this month, but I’m quite sure I won’t be achieving or attempting that style this time round. This style of painting creates a realistic illusion of space in the image, so convincing that the viewer feels as if able to walk through the setting or pick up the objects in the pictorial space. I decided to select a new group of objects to try out. I’d considered things like one of my mum’s nicest tea-towel or her tray, both from the seventies, and her tea service and tea-cups on one of her tablecloths, or any number of tiny trinkets that were passed on to me when she died two years ago this month. But they’re not really what I had in mind as a picture for my small bedroom/study so best saved for another time. So now I have TWO on-going still-life arrangements set-up to practise with while I take my time playing with ideas. You can see my drawing of the first group of objects here or visit to read my post for the letter R if you missed it along the way. I was complimented on the TACTILE value of the ring in that piece in a comment from Pam, a tremendously talented writer blogging at Catch My Drift. Tidying my way to other things I might like to try using instead is also on today’s to-do list (again!). As for the final picture, only time will tell – and anyway, you’ve a whole week to wait until ‘Z’ day for that reveal (Monday 30th). By the way, black, red, grey and blue don’t match the accent colours of my room at all so TONAL drawings and/or creative license to apply therein. Have you made a visual or TEXTUAL art work to pay TRIBUTE to the memory of a loved one? Are you currently working on a project over time with a particular tenor and tenet in mind? I’d love to hear your thoughts if you’d like to share a comment below this post.